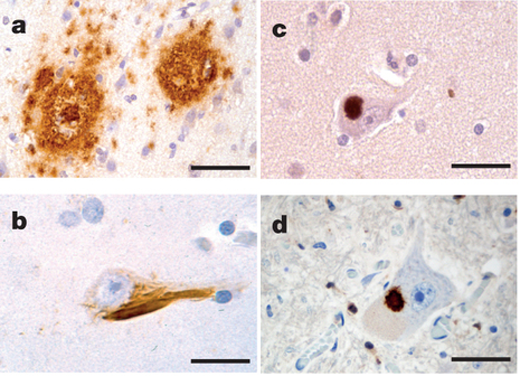 In Nature, Walker and Jucker describe how prion-like protein aggregates drive the progression of several neurodegenerative diseases. Two leading neurology researchers have proposed a theory that could unify scientists’ thinking about several neurodegenerative diseases and suggest therapeutic strategies to combat them. The theory and backing for it are described in the September 5, 2013 issue of Nature. Mathias Jucker and Lary Walker outline the emerging concept that many of the brain diseases associated with aging, such as Alzheimer’s and Parkinson’s, are caused by specific proteins that misfold and aggregate into harmful seeds. These seeds behave very much like the pathogenic agents known as prions, which cause mad cow disease, chronic wasting disease in deer, scrapie in sheep, and Creutzfeldt-Jakob disease in humans. Walker is research professor at Yerkes National Primate Research Center, Emory University. Jucker is head of the Department of Cellular Neurology at the Hertie Institute for Clinical Brain Research at the University of Tübingen and the German Center for Neurodegenerative Diseases. Unlike prion diseases, which can be infectious, Alzheimer’s, Parkinson’s, and other neurodegenerative diseases can not be passed from person to person under normal circumstances. Once all of these diseases take hold in the brain, however, it is increasingly apparent that the clumps of misfolded proteins spread throughout the nervous system and disrupt its function. The authors were the first to show that a protein that is involved in Alzheimer’s disease – known as amyloid-beta – forms prion-like seeds that stimulate the aggregation of other amyloid-beta molecules in senile plaques and in brain blood vessels. Since then, a growing number of laboratories worldwide have discovered that proteins linked to other neurodegenerative disorders also share key features with prions. Age-related neurodegenerative disorders remain stubbornly resistant to the discovery of effective treatments. Jucker and Walker propose that the concept of pathogenic protein seeding not only could focus research strategies for these seemingly unrelated diseases, but it also suggests that therapeutic approaches designed to thwart prion-like seeds early in the disease process could eventually delay or even prevent the diseases.